We're a huge fan of the Huawie Ideos phones. They are ridiculously cheap, $100 unlocked, and can be bought over the counter at Safaricom in Kenya or about $120 from NewEgg in the states. That is a crazy pricepoint, totally blowing away any other Android phone and really making J2ME handsets mostly irrelevant as contenders for the kind of ICT4D projects Nyaruka undertakes. Recently we've been working with a client and have been considering using these as a way of managing and tracking inventory. After all, the cheapest barcode scanners are around the same price, and you don't get a built in touch screen, GSM connectivity, GPS and the ability to build the entire application on the device. That makes the Ideos mighty tempting indeed. One thing we were curious about though is just how well they would perform with high resolution 2D barcodes. In our case, we'd like to have the option to encode quite a bit of data in the barcodes, so we were curious how the inexpensive Ideos optics would fare. We created and printed 2D bar codes encoding 23, 50, 100, 200, 500 and 1000 characters, then tested them at different sizes. The codes were all generated at Invx.com, which seemed to do a decent job, even for our monster 1000 character barcode. We printed each using a laser printer and scaled them from roughly 4"s to 2"s and finally 1" squared. This was under normal lighting conditions using the most excellent "Barcode Scanner" app in the Android App store which uses the open source ZXing library. We also tried things out with a Nexus S, and a Sidekick 4G. The big knock to the Ideos is that it is a fixed focus camera, despite being 3.15 megapixels. What that means in this application is that you always need to hold the Ideos at a fixed distance from the code in order to get a sharp picture, which means that you start running into the limitations of the sensor resolution for the higher data QR codes. The Sidekick4G and Nexus on the other hand, have autofocus cameras, which help greatly. The Sidekick also has a 3 megapixel camera, but it is able to focus so fares much better. The Nexus S has a 5 megapixel camera with auto-focus, so should be the best yet. For each phone and barcode, we ran a series of tests and ranked the performance as Fail, Poor, Good or Excellent. Fail means that we either couldn't get the phone to read the barcode at all, or it was very, very difficult. Ok means that it took a good bit of searching to read the barcode, but it did so consistently. Good meant the barcode was easily read when well aligned and Excellent meant the barcode was instantly read even when misaligned or at an oblique angle. Excellent readings have that magical quality to them where you just wave the phone in the general direction of the code and it picks it up. That's the Ideos quite easily reading the 100 character 2" barcode and struggling on the 1" version. You can see that the 2" code takes up a greater size so reads easily, but the smaller 1" code doesn't. We can't move closer to the 1" code to make it fill the screen as then it becomes out of focus. One interesting learning there is that you can work around that resolution if you have the freedom to make larger QR codes. The 'optimum' size for a code for an Ideos is probably around 3"'s square, that would fill the frame at the exact distance where it is focused. We didn't try this out, but I bet you could get a 200 character code reading excellently. The benefit of the autofocus is obvious when you compare the Ideos results to the Sidekick, which has a similar resolution, though much better optics and autofocus. The Sidekick has no problem reading even 500 character barcodes at 1". For all practical purposes the Nexus doesn't do any better, which probably indicates that we are reaching the limits of the optics rather than the limits of the sensor sizes. So what are the practical limits? On an Ideos, I would stick to ~100 characters or less on a 2" bar code, and ~50 characters or less on a 1" barcode. At those sizes things work brilliantly, instant recognition at virtually any angle. On an autofocusing device, you have a lot more flexibility. Even at 1" you can easily decode codes with up to 500 characters. 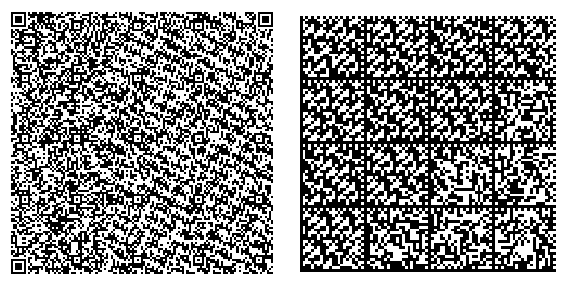 For QR codes that seems to be the practical limit, though if you are willing to use a DataMatrix code you might be able to squeeze a bit more in. The two biggest 2D barcode standards for this kind of application are QR Codes and DataMatrix codes. DataMatrix is actually the older standard, but due to leaving out support for Kanji characters, QR Codes were created in Japan and have been taking over. There are some advantages and disadvantages to each. QR Codes are more tolerant to being read at oblique or rotated angles. The guide blocks in the corners seem to help tremendously here and I definitely noticed faster and more consistent reading for QR codes. However, those blocks come at the cost of data density. Here are the two 1000 character codes used in these tests, the QR code at left and the DM code at right. You can see that the DM code requires less resolution to read, so by and large the DM codes tended to fail last, at least when good alignment was used. One interesting feature of QR codes is that they are a bit more tolerant to errors. You can cover up the bottom right corner of a QR code and it will usually still read, the DM codes are more sensitive here. This might be an overstated benefit though, as I didn't have as much luck covering up the top right, left, or bottom left corners of QR codes, where the guide blocks are, so the practical cases where the error correction would come in seem minimal. Error correction is something you can tune in QR codes, some generators lets you define more redundancy in the generated code. However, this will presumably come with lower data density, so is probably very specific to your application. Strangely, the lowest resolution QR code generated, of 23 characters, actually was troublesome to read in many cases. Looking at it closely it looks like it contains one less control block than the 50 character code. You can see that below, the 23 character on the left vs the 50 character on the right. This might just be a limitation or bug in the scanning software itself, but does point out that real world testing is still really important. The DM code didn't display any such issues. 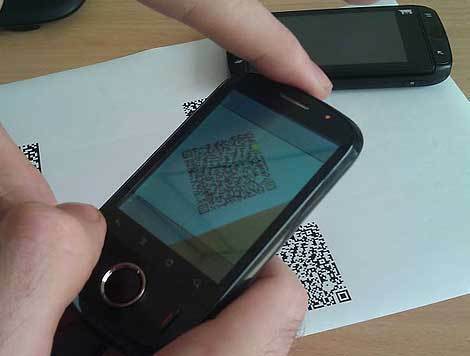 QR Code is very popular now, I know I can easy find a QR Code scanner for android on websites, but it's difficult to find a resource for generating QR Code on android phone, so do you have any free resources? Any help will be appreciated.